Your Ram truck is designed to make your life easier: on the road, behind the wheel, and everywhere in between. That is why it is loaded with cutting-edge features and advanced capabilities to help expedite your experience and make accessing certain areas of your truck more efficient. One such feature is the Ram Multifunction Tailgate. You can learn more about it in this quick video! Here at Larry H. Miller Chrysler Dodge Jeep Ram Riverdale, we are proud to have a plethora of Dodge models available for you to test drive. Thanks to their power, their innovation, and their incredible capabilities these vehicles have long been renowned for their impressive capabilities on the road. Have You Seen the Reveal of the 2019 Ram Super Duty Yet? Even if you have never driven a Ram truck before, you know they have a standard for strength and excellence on the road. Whether you are towing large loads, need to handle a tough stretch of road, or even need conquer an off-road path these trucks will give you the versatility and power you need to succeed in your goals. Accessibility is a vital component of your driving experience. This is especially true for drivers who like to conquer difficult terrains and off-road paths. With a vehicle like the Jeep Grand Cherokee by your side, traveling to these locations and handling these difficult terrains is easy. Just check out this video, and you can see the ways in which this Jeep vehicle can benefit you on the road! You expect durability from utility vehicles and Ram delivers with the 2018 Ram ProMaster City. Not only does this vehicle offer excellent power that is supported by a 9-speed transmission, by the 2018 Ram ProMaster City offers great fuel economy. You can get around 21 miles per gallon (MPG) in the city and about 28 MPG on the highway in this utility vehicle. 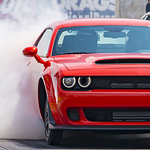 The Dodge Challenger is exactly the kind of vehicle that you need if you are the type of person who wants to have a lot of strength and power in whatever it is that you take out on the road. When you want a full-sized minivan that has enough power to tow a trailer and the latest safety features to take care of you and your passengers on the road, consider the 2018 Dodge Grand Caravan. Powered by an award-winning 3.6L Pentastar V6 engine that can run off of both regular unleaded gasoline and E85, there's nothing this van can't handle. When it comes to impressing both drivers and passengers with expertly crafted tech features, the 2018 Dodge Journey hit it out of the park. The interior tech features were designed to keep everyone in the 2018 Dodge Journey as comfortable as possible. Take the stress out of driving to new places with the real-time navigation system available in the 2018 Dodge Journey.